Our driver meets you at the exit gate, with a board on which your name is written and transfers you to your hotel. Rest of the day on your own. Overnight in Cappadocia. 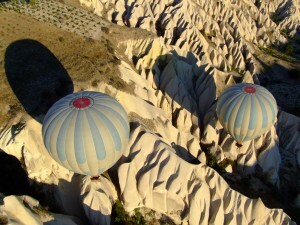 60 minute hot air balloon ride over the lunar landscape of Cappadocia at dawn. Our guide and driver will pick you up at 09:30 for a full day tour.Start the day visiting Devrent Valley, also known as “Imagination Valley”, this is the most surreal-looking landscape. Your next stop will be Pashabagi also called the Monks Valley because Christian hermits chose to locate hermit cells and churches in these three-headed pinnacles symbolic of the Holy Trinity, it’s possible to see all the stages in the formation of fairy chimneys at this spot. Proceed to Avanos (Venessa) the pottery centre of Cappadocia, this village is set on the banks of the Kizilirmak/Red River. The river gets its name from the red clay it deposits. You can watch the potters at work using kick wheels, the technique which has remained unchanged for generations. Lunch in a Local Restaurant Continue to Göreme Open Air Museum. The world’s most important Byzantine cave churches are found in these once remote valleys where monks and nuns pursued monastic life from the 3rd century on. Here you can see the best preserved Byzantine cave wall paintings and frescos from the Iconoclastic period through to the end of Seljuk rule. Icons with scenes from the Old Testament and the New Testament above portraits of Church Fathers and saints depict the structure of the Byzantine universe. Panoramic view point Esentepe. With a spectacular view over Göreme, see the complete view of Goreme valley and Goreme village: fairy chimneys, rock formations and cave houses. End your day with Uchisar Castle. This tall rock, the highest point of the Goreme region. After tour we transfer you to airport. Me and my partner are interested in a 2 day tour, leaving Istambul and arriving Kayseri at 7 am, on 29th September. 1 -PLease, can you inform us about the hotels your tour provide? Or should we book the hotel? 2 -On the first day , is it possible for a horseback tour? 3 – The price of 195 € is included the hot air ballon?